AI technology is a hot topic in marketing at the moment, but AI is a broad term covering a wide range of different technologies. Artificial intelligence means any technology that seeks to mimic human intelligence, which covers a huge range of capabilities such as voice and image recognition, machine learning techniques and semantic search. Marketers like to wax lyrical about the latest exciting technologies and bang on about AI for image recognition, speech recognition, preventing data leaks, or even targeting drones at remote communities. All well and good. But how are marketers supposed to do anything with that information? It's just hype, you can't implement it. That's why in our AI and Machine Learning briefing for members we have identified fifteen artificial intelligence techniques that businesses of all sizes can implement, rather than techniques which only major tech giants can devote resources to. 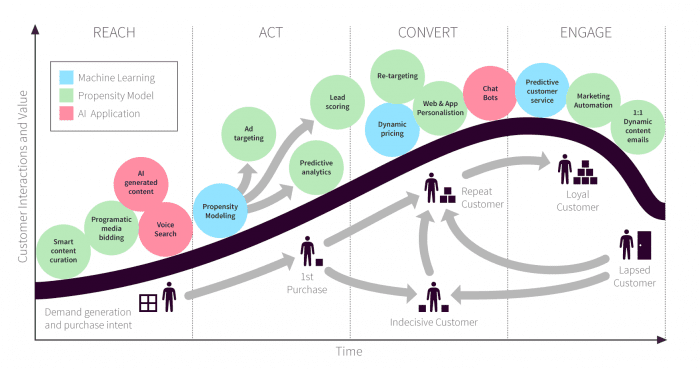 We've plotted the techniques across the customer lifecycle so you can see how each AI tactic can help take your customers down the marketing funnel. All the techniques are 'AI' in the sense that they involve computer intelligence, but we've broken them down into 3 different types of technology - Machine Learning Techniques, Applied Propensity Models, and AI Applications. Machine learning techniques involve using algorithms to 'learn' from historical data sets, which can then create propensity models. Applied propensity models are when these propensity models are put to work predicting given events- such as scoring leads based on their likelihood to convert. AI applications are other forms of AI, which do tasks one would usually associate with a human operator such as answering customer questions or writing new content. Each different application has major implications for marketers, but the applications have different roles to play across the customer journey. Some are better for attracting customers, whilst others are useful for conversion or re-engaging past customers. That's why we've divided the techniques across the RACE framework. Reach involves using techniques such as content marketing, SEO and other 'earned media' to bring visitors to your site and start them on the buyer's journey. AI & applied propensity models can be used at this stage to attract more visitors and provide those that do reach your site with a more engaging experience. This is a really interesting area for AI. AI can't write a political opinion column or a blog post on industry-specific best practice advice, but there are certain areas where AI generated content can be useful and help draw visitors to your site. For certain functions AI content writing programs are able to pick elements from a dataset and structure a ‘human sounding’ article. An AI writing program called ‘WordSmith’ produced 1.5 billion pieces of content in 2016, and is expected to grow further in popularity in the coming years. AI writers are useful for reporting on regular, data-focused events. Examples include quarterly earnings reports, sports matches, and market data. If you operate in a relevant niche such as financial services, then AI generated content could form a useful component of your content marketing strategy. 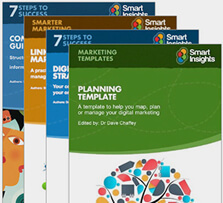 There are now solutions from vendors available and returning good results in copywriting for Facebook Ads, Email subject lines and nurturing emails that we highlight in the latest edition of our AI guide. AI powered content curation allows you to better engage visitors on your site by showing them content relevant to them. This technique is most commonly found in the 'customers who bought X also bought Y' section on many sites, but can also be applied to blog content and personalizing site messaging more widely. It's also a great technique for subscription businesses, where the more someone uses the service, more data the machine learning algorithm has to use and the better the recommendations of content become. Think of Netflix's recommendation system being able to consistently recommend you shows you'd be interested it. Voice search is another AI technology, but when it comes to using it for marketing, it's about utilizing the technology developed by the major players (Google, Amazon, Apple) rather than developing your own capability. Voice search will change future SEO strategies, and brands need to keep up. Brand that nail voice search will leverage gains in organic traffic with high purchase intent thanks to increased voice search traffic due to AI driven virtual personal assistants. Programmatic Media buying can use propensity models generated by machine learning algorithms to more effectively target ads at the most relevant customers. Programmatic ads need to get smarter in the wake of Google's recent brand safety scandal. It was revealed ads placed programmatically through Google's ad network were appearing on terrorist's websites. AI can help here by recognizing questionable sites and removing them from the list of sites ad's can be placed on. As already mentioned, propensity modeling is the goal of a machine learning project. The machine learning algorithm is fed large amounts of historical data, and it uses this data to create a propensity model which (in theory) is able to make accurate predictions about the real world. The simple diagram below shows the stages of this process. Propensity modeling can be applied to a number of different areas, such as predicting the likely hood of a given customer to convert, predicting what price a customer is likely to convert at, or what customers are most likely to make repeat purchases. This application is called predictive analytics, because it uses analytics data to make predictions about how customers behave. The key thing to remember is that a propensity model is only as good as the data provided to create it, so if there are errors in your data or a high level of randomness, it will be unable to make accurate predictions. Propensity models generated by machine learning can be trained to score leads based on certain criteria so that your sales team can establish how 'hot' a given lead is, and if they are worth devoting time to. This can be particularly important in B2B businesses with consultative sales processes, where each sale takes a considerable amount of time on the part of the sales team. By contacting the most relevant leads, the sales team can save time and concentrate their energy where it is most effective. The insights into a leads propensity to buy can also be used to target sales and discounts where they are most effective. Machine learning algorithms can run through vast amounts of historical data to establish which ads perform best on which people and at what stage in the buying process. Using this data they can serve them with the most effective content at the right time. By using machine learning to constantly optimize thousands of variables you can achieve more effective ad placement and content than traditional methods. However, you'll still need humans to do the creative parts! All marketers know that sales are effective at shifting more product. Discounts are extremely powerful, but they can also hurt your bottom line. If you make twice as many sales with a two-thirds smaller margin, you've made less profit than you would have if you didn't have a sale. Sales are so effective because they get people to buy your product that previously wouldn't have considered themselves able to justify the cost of the purchase. But they also mean people that would have paid the higher price pay less than they would have. Dynamic pricing can avoid this problem, by targeting only special offers only at those likely to need them in order to convert. Machine learning can build a propensity model of which traits show a customer is likely to need an offer to convert, and which are likely to convert without the need for an offer. This means you can increase sales whilst not reducing your profit margins by much, thus maximizing profits. Using a propensity model to predict a customer's stage in the buyer's journey can let you serve that customer, either on an app or on a web page, with the most relevant content. If someone is still new to a site, content that informs them and keeps them interested will be most effective, whilst if they have visited many times and are clearly interested in the product then more in-depth content about a product's benefits will perform better. Chatbots mimic human intelligence by being able to interpret consumer’s queries and complete orders for them. You might think chatbots are extremely difficult to develop and only huge brands with massive budgets will be able to develop them. But actually, using open chatbot development platforms, it's relatively easy to create your own chatbot without a big team of developers. Our AI guide highlights open source technologies from Facebook and Google which brands such as Dominos and KLM are using for developing their own chatbots for customer service. Much like with ad targeting, machine learning can be used to establish what content is most likely to bring customers back to the site based on historical data. 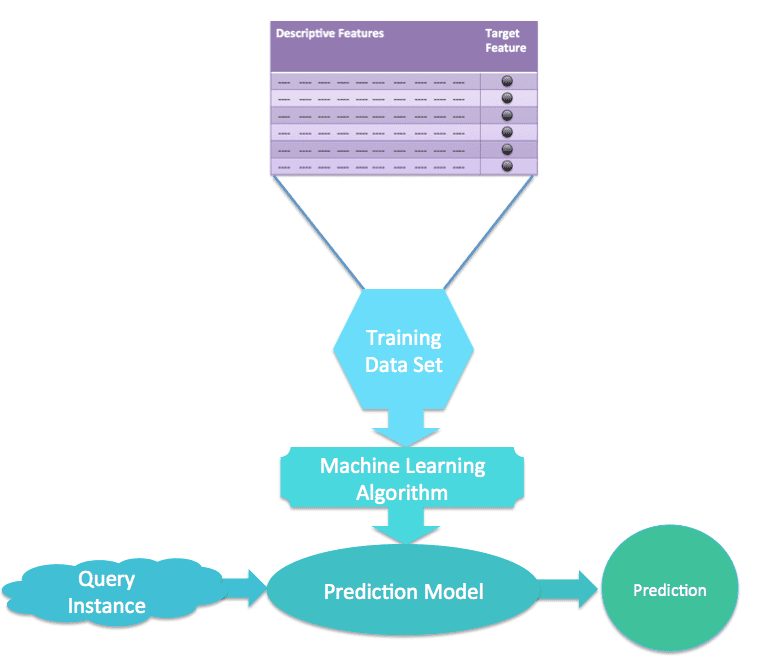 My building an accurate prediction model of what content works best to win back different types of customers, machine learning can be used to optimize your retargeting ads to make them as effective as possible. It's far easier to make repeat sales to your existing customer base than it is to attract new customers. So keeping your existing customers happy is key to your bottom line. This is particularly true in subscription-based business, where a high churn rate can be extremely costly. Predictive analytics can be used to work out which customers are most likely to unsubscribe from a service, by assessing what features are most common in customers who do unsubscribe. It's then possible to reach out to these customers with offers, prompts or assistance to prevent them from churning. Marketing automation techniques generally involve a series of rules, which when triggered initiative interactions with the customer. But who decided these rules? Generally, a marketer who's basically guessing what will be most effective. Machine learning can run through billions of points of customer data and establish when are the most effective times to make contact, what words in subject lines are most effective and much more. These insights can then be applied to boost the effectiveness of your marketing automation efforts. In a similar fashion to marketing automation, applying insights generated from machine learning can create extremely effective 1:1 dynamic emails. Predictive analytics using a propensity model can establish a subscribers propensity to buy certain categories, sizes and colors through their previous behavior and displays the most relevant products in newsletters. The product stock, deals, pricing is all correct at the time of opening the email. The guide aims to help businesses of all sizes embrace Machine Learning and AI to benefit marketing efforts. It shows how businesses can effectively manage machine learning projects in place, and how to use the insights generated to improve marketing results.